Another one of our advent calendar days we recently celebrated was Candy Cane day. 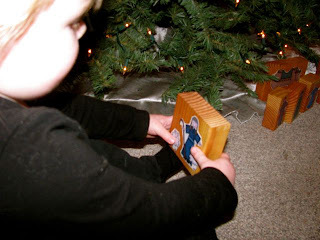 I showed my daughter the shepard from her nativity block set and we briefly talked about his role. I pointed out the cane he was holding and let her make the connection that it looked like a candy cane! Pretty exciting for a 2 year old, let me tell you! We then read a couple Nativity books (Boo is obsessed with all babies being “baby Jesus” right now- and wanted to hear more and more about Him! Cute, eh!) We also ate some delicious candy canes- our first ones this year! My daughter can eat a candy cane faster than anyone else I have ever seen! What ever happened to slowly licking it- until the layers melted in your mouth and you could create a sharp point at the end… well, maybe its for the best that she can’t do that yet! 🙂 For more Candy Cane activities check out Carisa’s amazing post here– I am truly in awe of this woman! This entry was posted in celebrations and tagged nativity on December 11, 2009 by ktoponce. Awesome idea to delve into the sweetness of candy cane!